The eight countries he identified were Japan, Italy, Greece, France, the United States, the United Kingdom, Ireland and Spain. The International Monetary Fund (IMF) cautioned that rising government debt has replaced financial industry stress as the biggest threat to the global economy. Gross warned his readers to watch “the U.S. with its large deficits and exploding entitlements.” We recommend that you reduce your investments in these countries. Our own government spending spree was not necessary. A Heritage Foundation study concluded that the stimulus money spent by countries had a negative short-term correlation with that country’s GDP. In other words, stimulus money may even have had a slight negative short-term effect as well as a stronger negative longer term effect. The IMF study agreed, stating, “Longer-run solvency concerns could translate into short-term strains in funding markets as investors require higher yields to compensate for future risks.” In other words, we’ve taken short-term financial illiquidity and turned it into a long-term government deficit, which in turn raises the cost of short-term liquidity. If you’ve lost your job or are struggling to live within your budget, running up your credit card never helps. It may make you feel better momentarily, but it doesn’t even really help your situation in the short term. Spending beyond your means only makes matters worse. And government spending is making everyone miserable. A small amount of government spending is necessary for infrastructure, which appears to boost economic activity. Successfully funding the rule of law provides the economic freedom necessary for economic activity. The optimum amount of spending appears to be relatively small, perhaps about 18% of GDP. In every economic analysis, greater government spending is associated with weaker economic growth. The Keynesian views of economic stimulus have been largely discredited, although its ideas continue to be misused politically to support massive government-spending programs. Government intervention continues to do more harm than good. This past year it took a common recession and prolonged it into a more permanent malaise. GDP growth, which has historically averaged 6.5%, is liable to slow to a more European rate of 3 to 4%. Official unemployment numbers will lower but only as people drop out and are no longer counted. Real unemployment is likely to remain high for some time. Lest you think these policies don’t affect you, they do. Part of Greece’s austerity measures include raising the retirement age 14 years. Lower U.S. stock returns could have the same impact on your ability to leave the workplace. For each 1% less in return over your working career, you will have to retire seven years later to achieve the same retirement lifestyle. Countries obligated to impose austerity measures illustrate the natural consequences of spending money you don’t have while taxing and regulating wealth creation. Politicians take the credit for enacting feel-good programs they can’t pay for, and then they scapegoat private enterprise to cover their misguided thinking. Reduce your investment in these countries. Put your money where the entrepreneurial spirit is rewarded and the welfare state is discouraged, not the other way around. We suggest lightening up on foreign investments that primarily just follow the MSCI EAFE index. EAFE stands for Europe, Australasia and the Far East. It represents all the developed countries outside of the United States and Canada. This includes large investments in all seven of the non-U.S. ring-of-fire countries. The EAFE consists of 22% Japan, 21% United Kingdom, 10% France, 4% Spain, 3% Italy and 1% Ireland and Greece. In total, 61% of the EAFE index is invested in ring-of-fire countries. 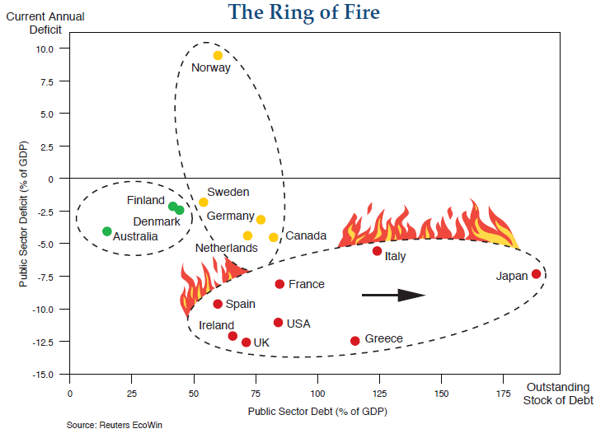 But before you stop investing in foreign stocks altogether, remember that 100% of domestic stocks are invested in the eighth ring-of-fire country, the United States. And we need our own austerity measures. The total compensation package for federal workers in the United States is $108,476–a full 55% higher than workers in private industry whose total compensation amounts to only $69,928. Going forward may be one of the times when a strong tilt toward specific foreign countries may provide superior long-term returns. Gross advises seeking return where “national debt levels are low, where reserves are high, and where trade surpluses promise to generate additional reserves for years to come.” This suggests investing more in emerging markets such as Chile, China, India and Brazil. It also includes emphasizing countries with economic freedom such as Hong Kong, Singapore, Australia, Switzerland and Canada. Or mostly free countries with lower debt such as Denmark, The Netherlands, Finland, Sweden, Austria, Germany or even Norway. These countries should outperform their debt-laden counterparts.